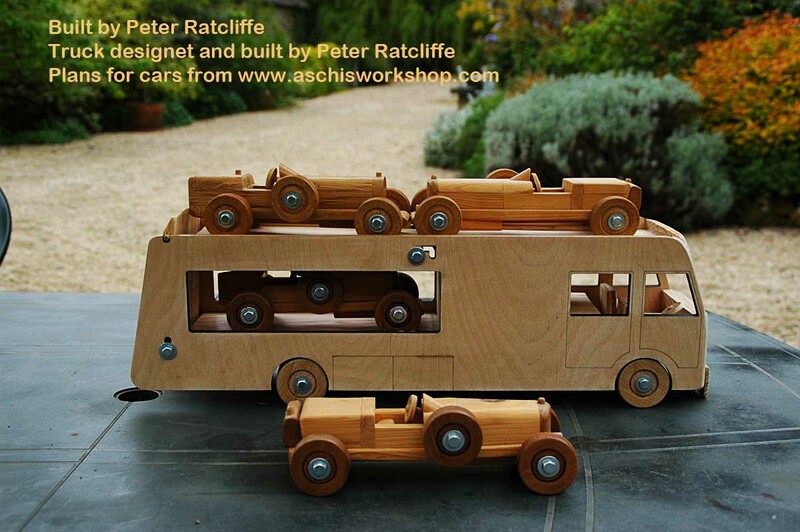 John Rhodes has built the Steam Traction Engines from Aschi's Workshop Plan #124. Pushed along, all wheels are turning and the Pisten Rod is moving. 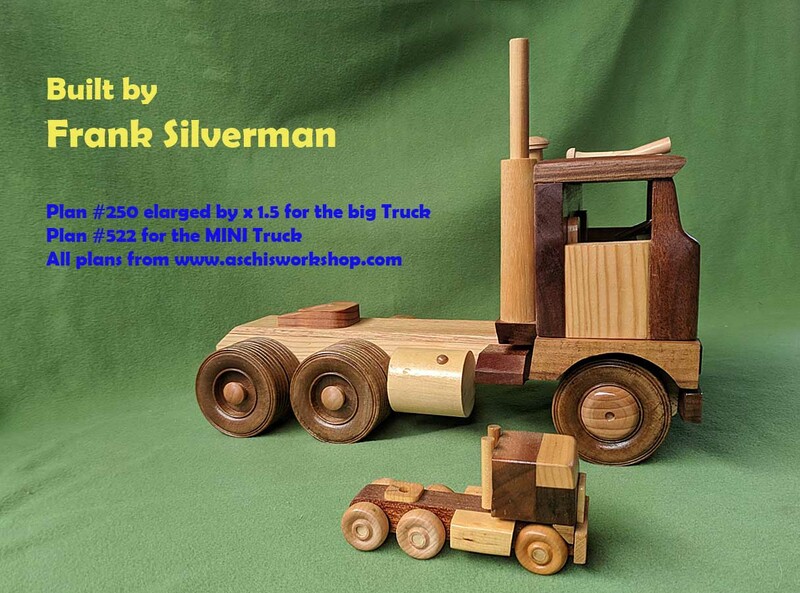 Franklyn Silverman is famous for building the MINI Series and also enlarging the 1:20 Plans by x1.5 and build real big toy models. 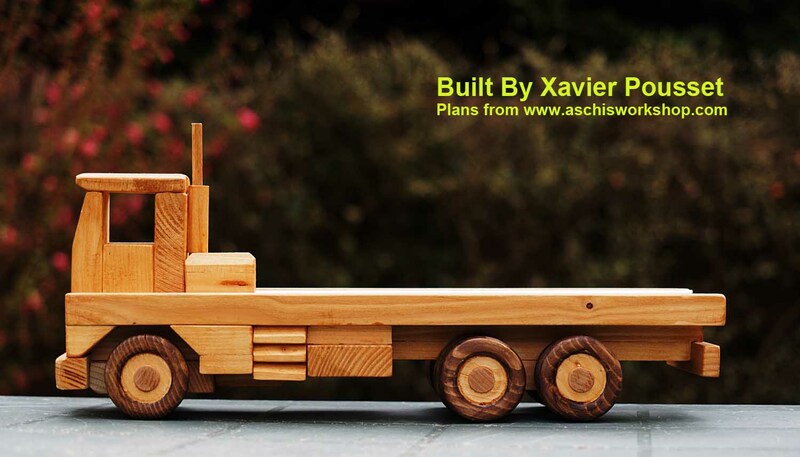 All plans from Aschi's Workshop. 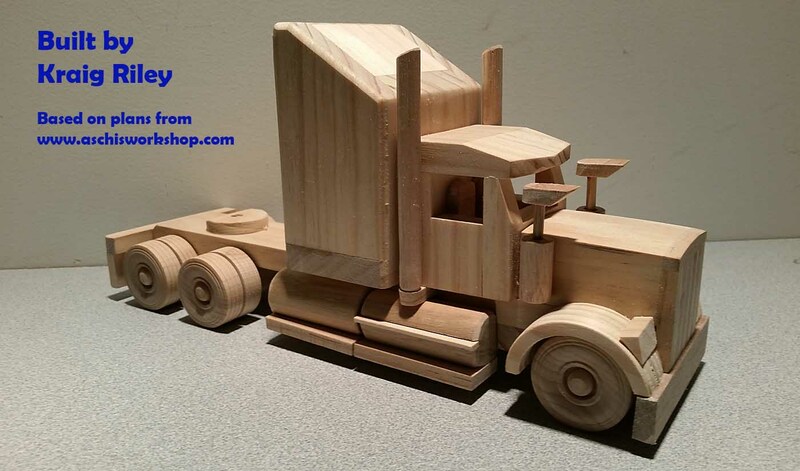 Steven: Thought I would send you a photo of how the truck came out. Enjoyed the build. Great plan. 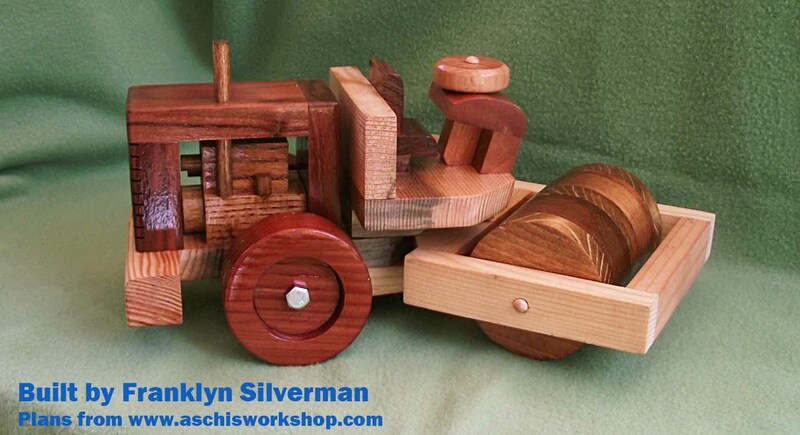 I retired this year and decided to make wooden toys for my grandkids this Christmas now that I had more shop time. 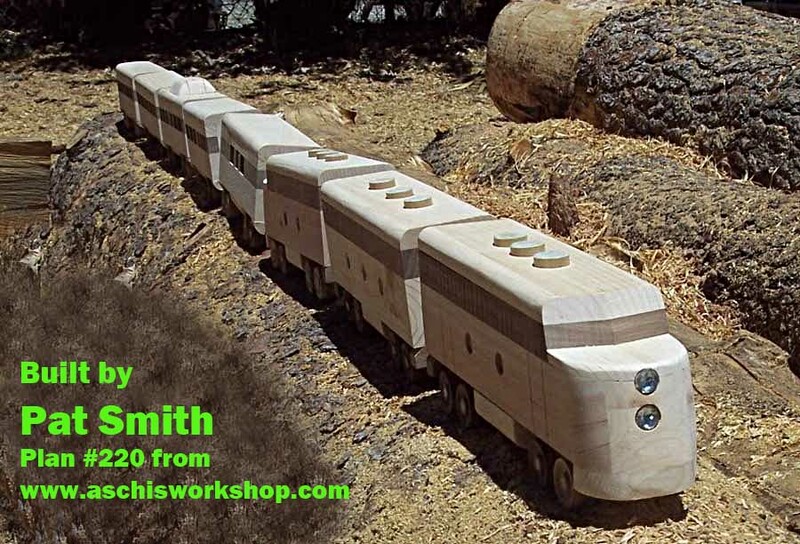 I am looking forward to building some more of your plans sometime next year. 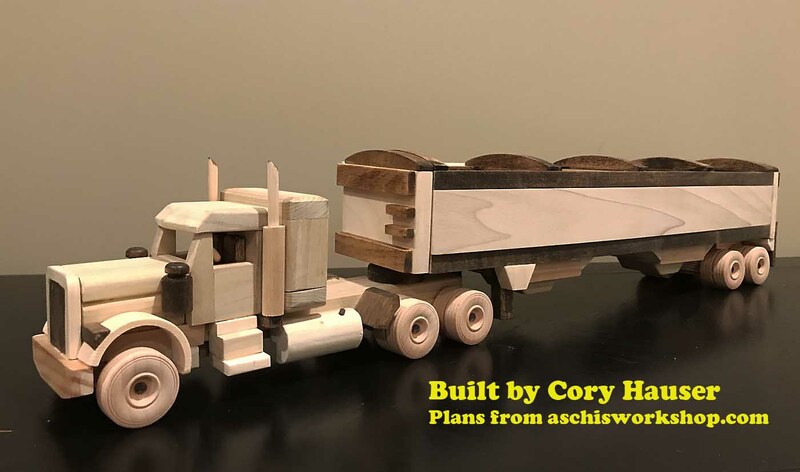 Cory Hauser has built the models from Aschi's Workshop Plans. This models are in 1:27 scale. 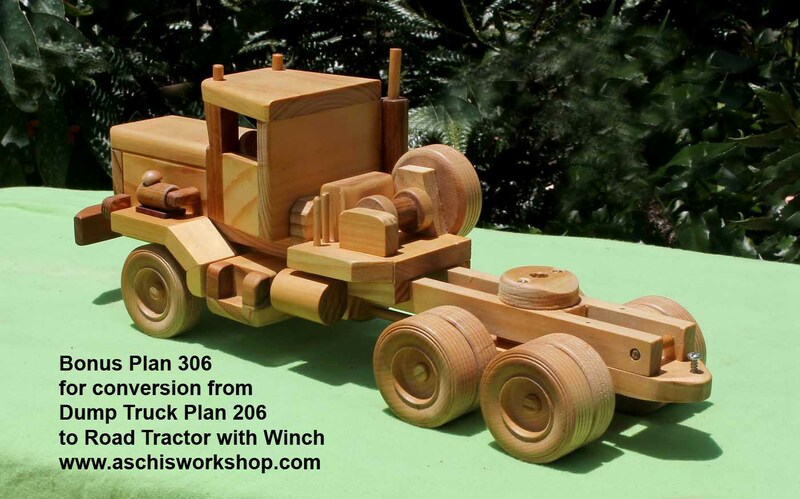 The truck plan is #280. There are 3 different versions to build from one plan. 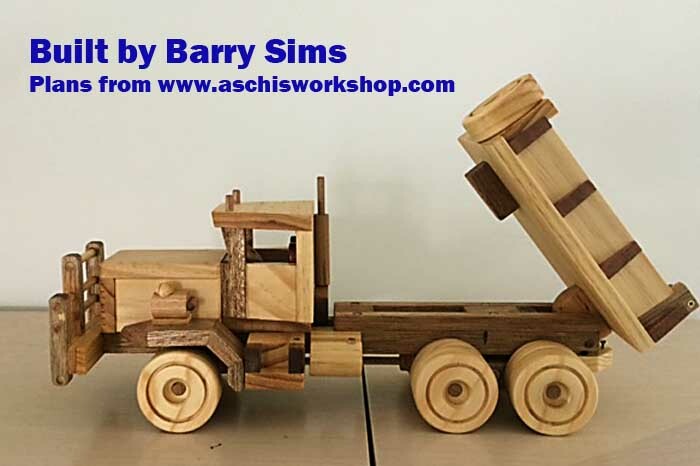 Check it out: www.aschisworkshop.com. 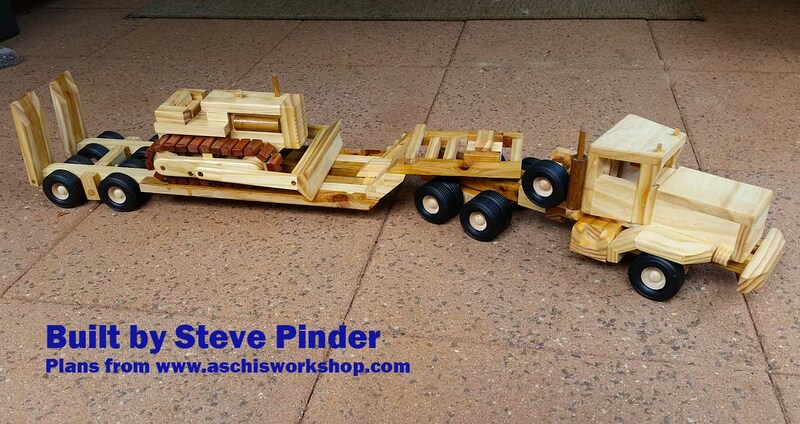 Steve Pinder is making a lot of toys for charity. 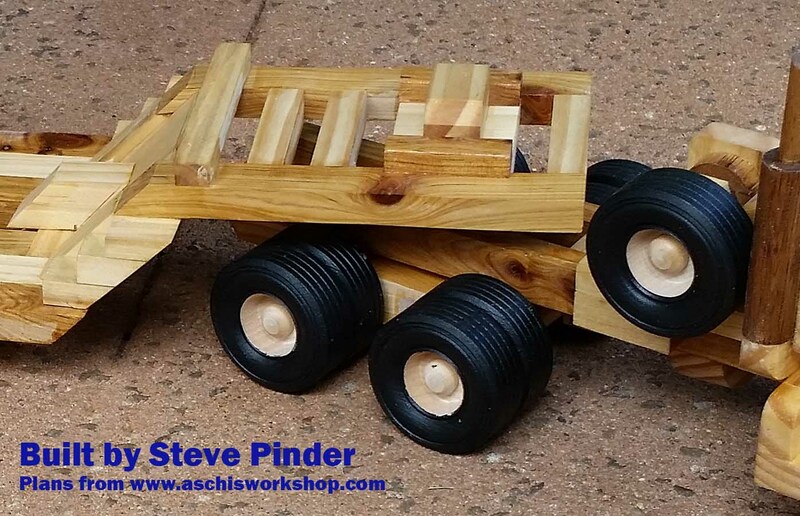 Steve likes to use the plans from Aschi's Workshop. Good to share the the pictures. 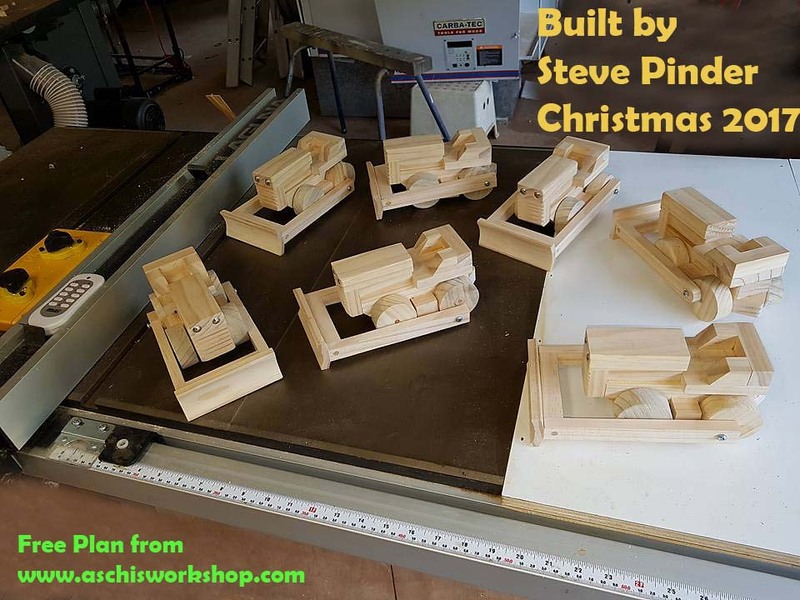 Pat Smith from California is celebrating Christmas with toys he made from Aschi's Workshop Plans. 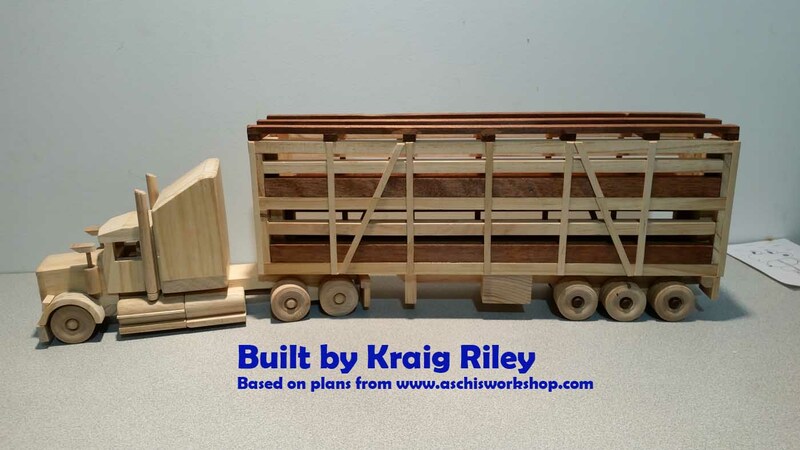 Kraig Riley from Australia has built the Prime Mover / Road Tractor for the Australian Live stock trailer. 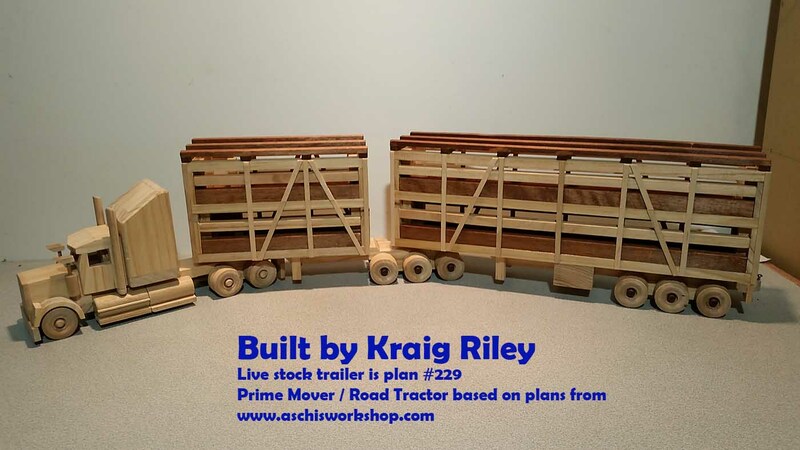 Kraig has built the trailer plan #229 and used the plan #280 to build his own Australian Prime mover. 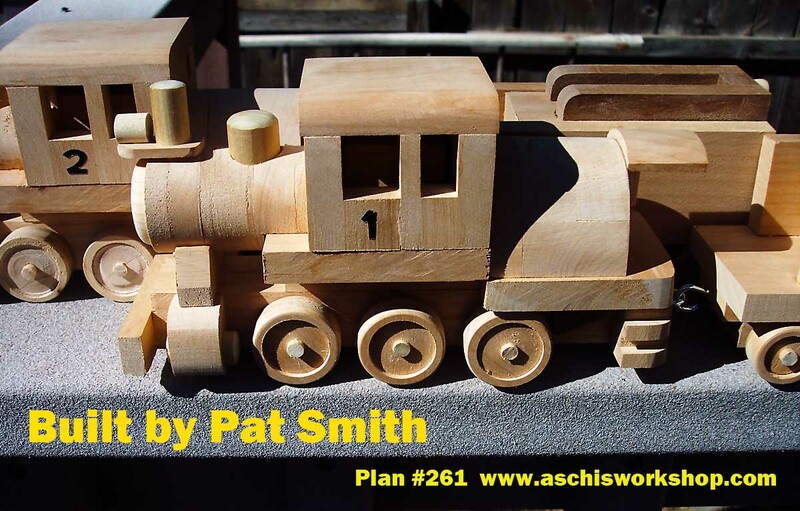 Aschi's Workshop got inspired and has created plan #284. THANKS TO KRAIG. 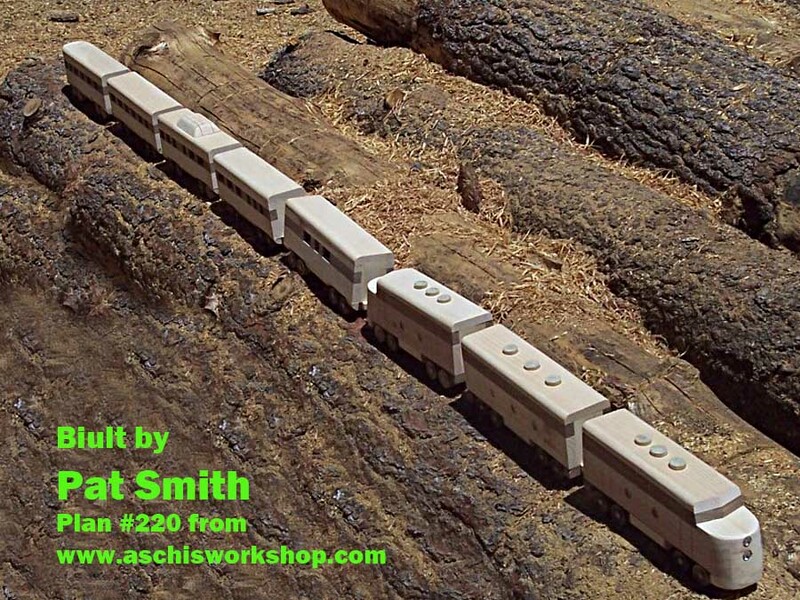 Pat Smith from California is building trains from Aschi's Workshop Plans. 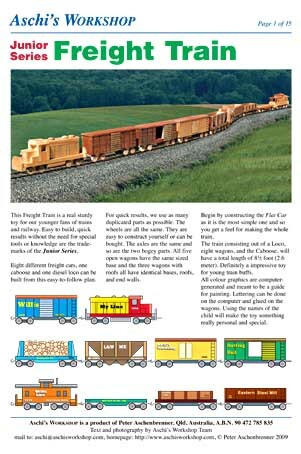 The trains from the JUNIOR series are all in the same scale and style. 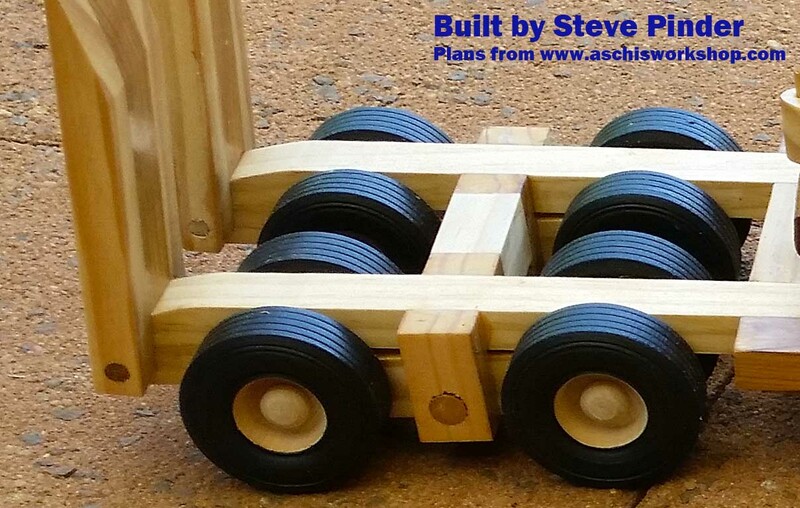 David Francis from Western Australia has built the Road Train from Aschi's Workshop Plans. 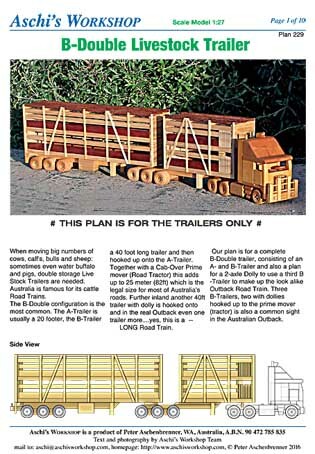 The plan for the bullBar is a FREE PLAN. 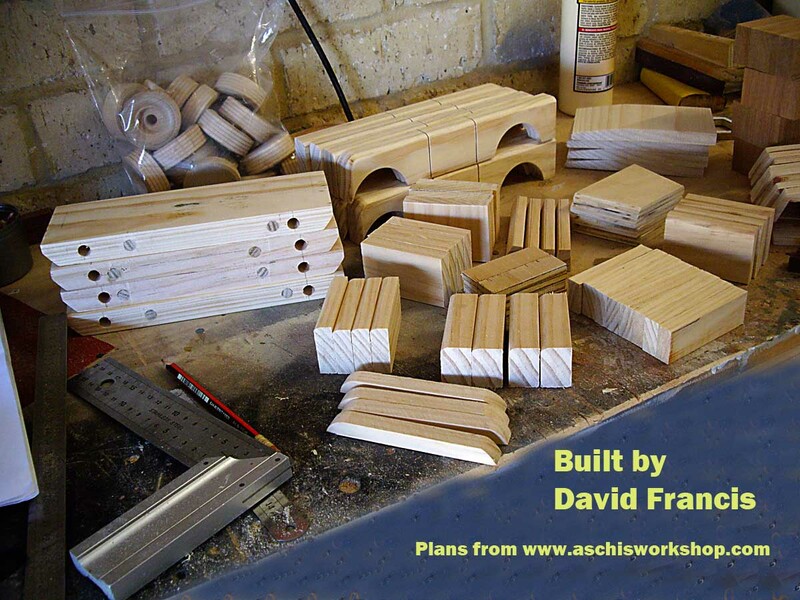 Mark Dyble from Stroke On Trent, UK is building models from Aschi's Workshop Plans. !! 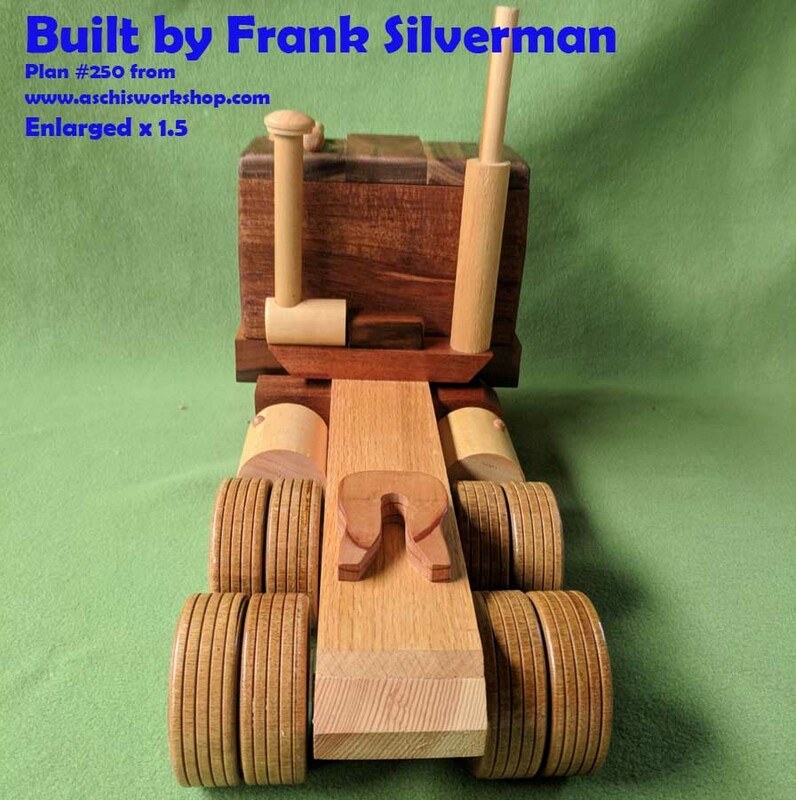 :I couldn't do this without your easy to use and follow plans.. they're spectacular and I look forward to seeing many more for purchase so I can do those too! 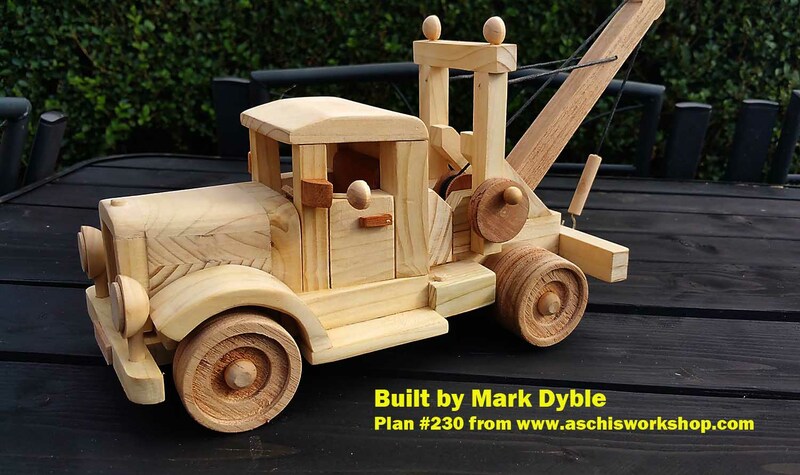 Mark Dyble: ...here are some photos of the work I've done using your plans. 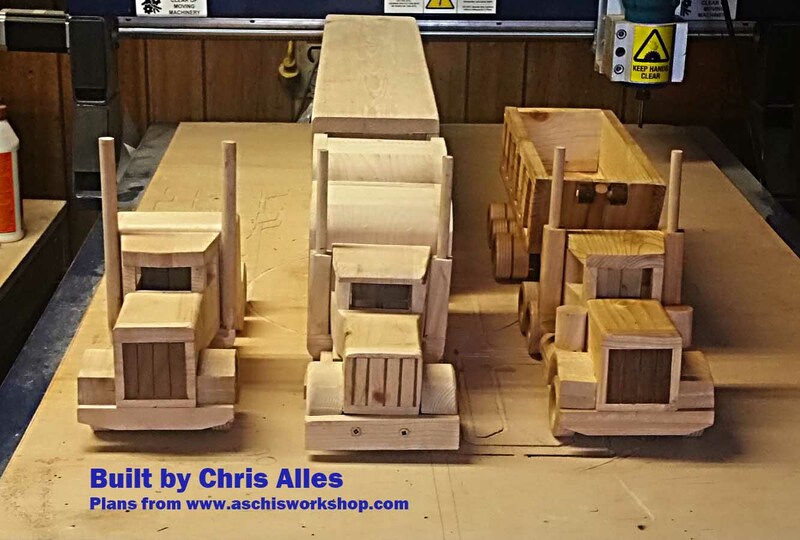 They're proving really popular.. so much so I'm currently making 4 of the big Peterbilt trucks with trailers.. two going off to America and the other 2 here in the UK. 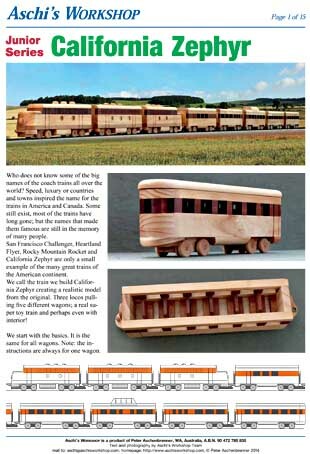 I love the plans and together with some of my own imagination they look superb. 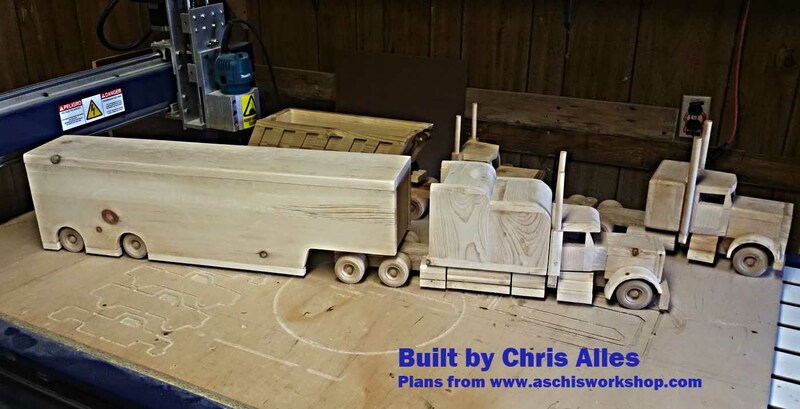 I particularly love the new truck plans..
Kraig Riley from Australia has built the B-Double Stock Trailer from Aschi's Workshop plan. Kraig is now working on the prime-mover as it called in Australia. 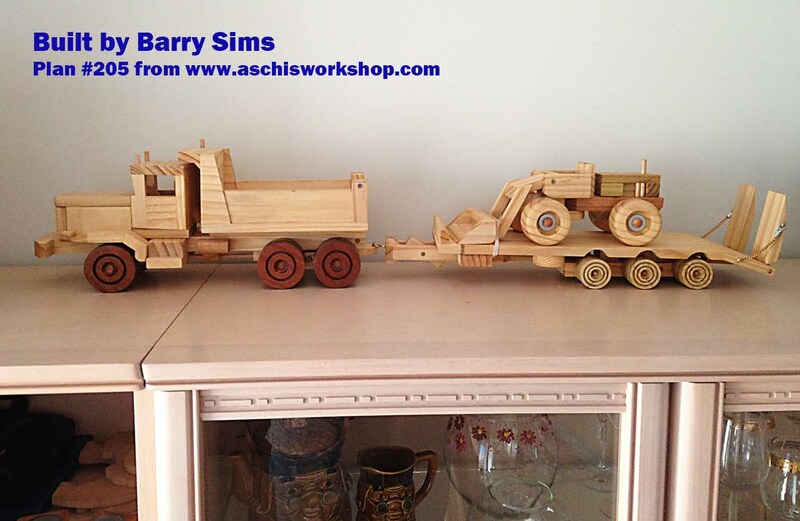 I have enclosed a photo of the two tippers I have just completed. As they were the first models I have made, I'm happy with the result. I hope my grandsons will enjoy them. 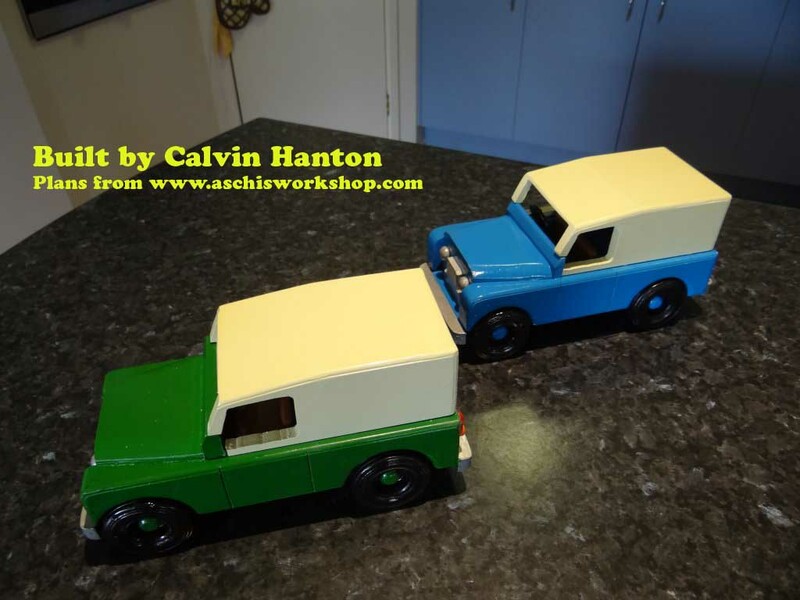 I have started two pulp trailers to go with the other two prime movers (I built four at once).Thanks again………Regards, Kevin Ransom. 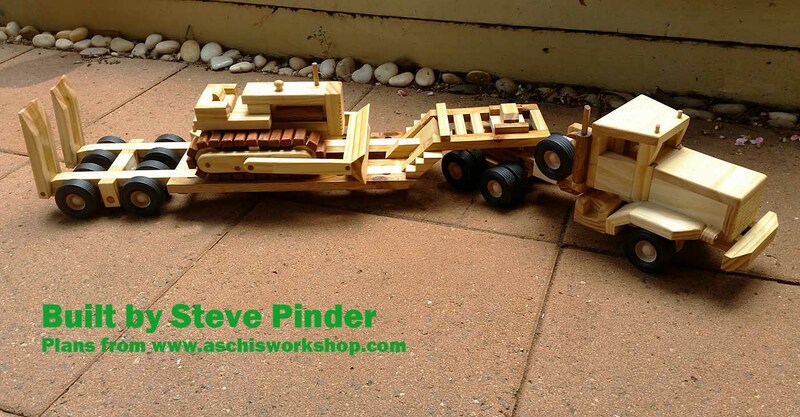 Col Ashy from Western Australia has used Aschi's Workshop Plan as base and scaled up to 1:12. 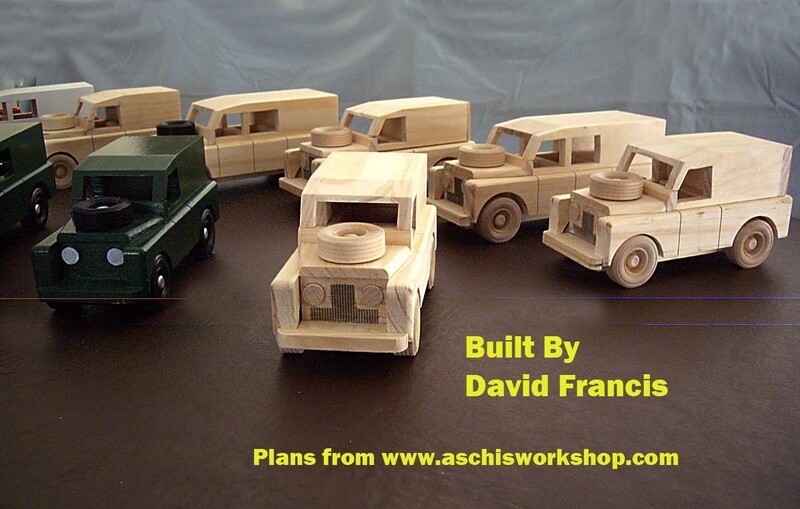 David Francis from Falcon / Western Australia has built a number of Land Rovers in divverent versions from Plan #188 from Aschi's Workshop. Paul Jobbins Video. 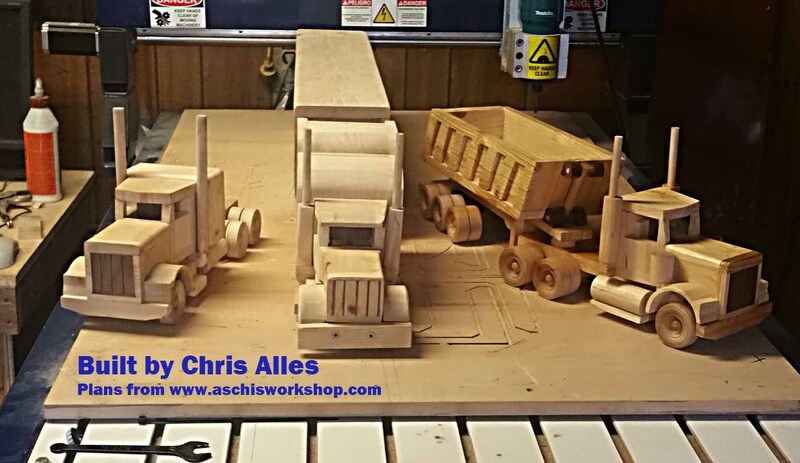 Chris Alles from Ontario is building models in Scale 1:20 from Aschi's Workshop Plans. 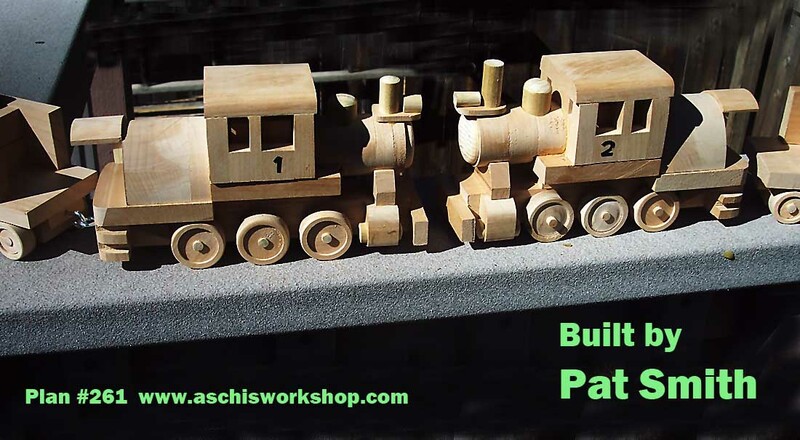 Check out the many Plans from Aschi's Workshop. 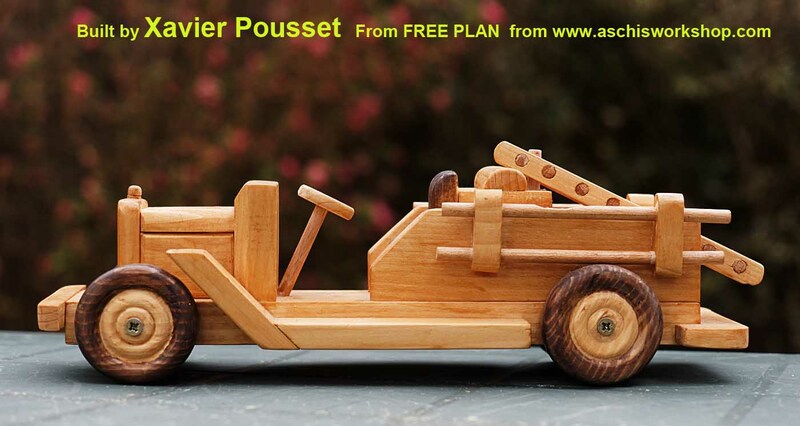 Easy to buid, no special tools needed.Request your FREE PLAN today. 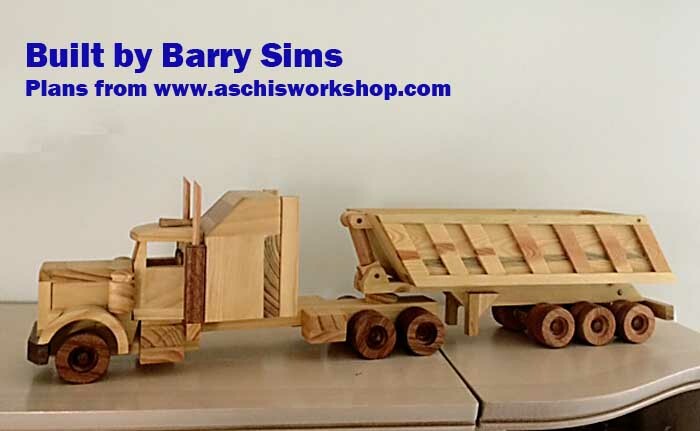 Barry Sims from Murray Bridge, South Australia: I have enjoyed making many of Aschi’s models (all over a dozen and have sold 8 different ones to friends) and find the plans easy to follow. I have made a few additions to some Models. 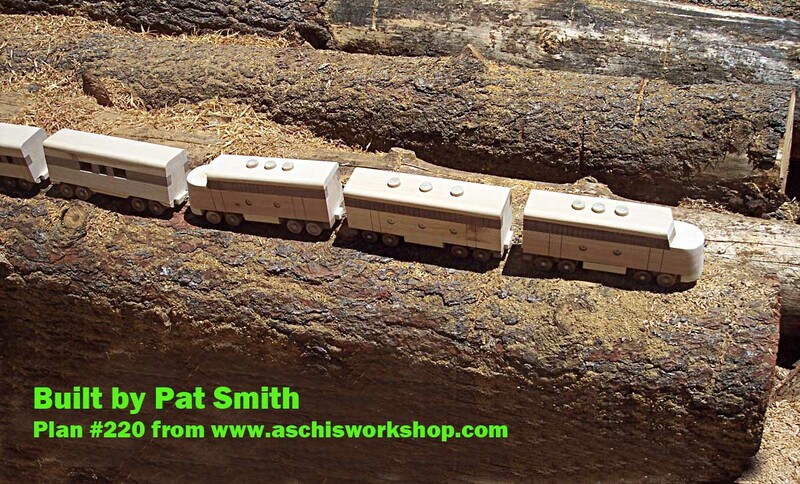 Barry has built the big truck, based on a Oshkosh and also used the extender/ conversin plans to make all this super models. 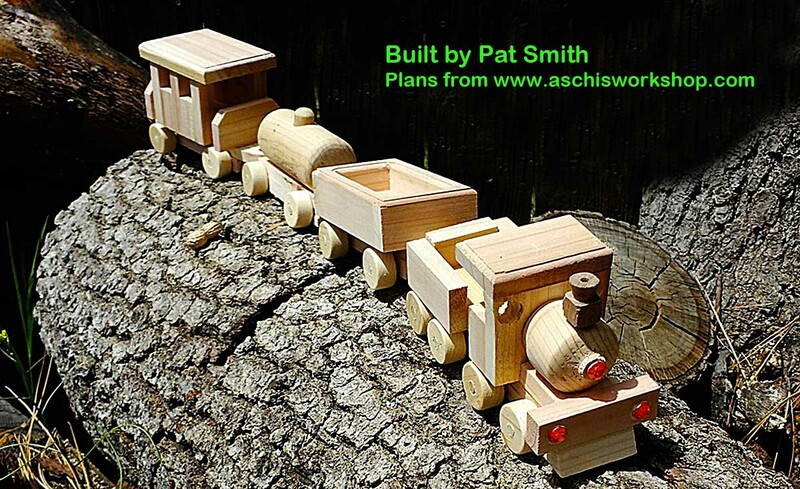 Check out the plans from Aschi's Workshop. 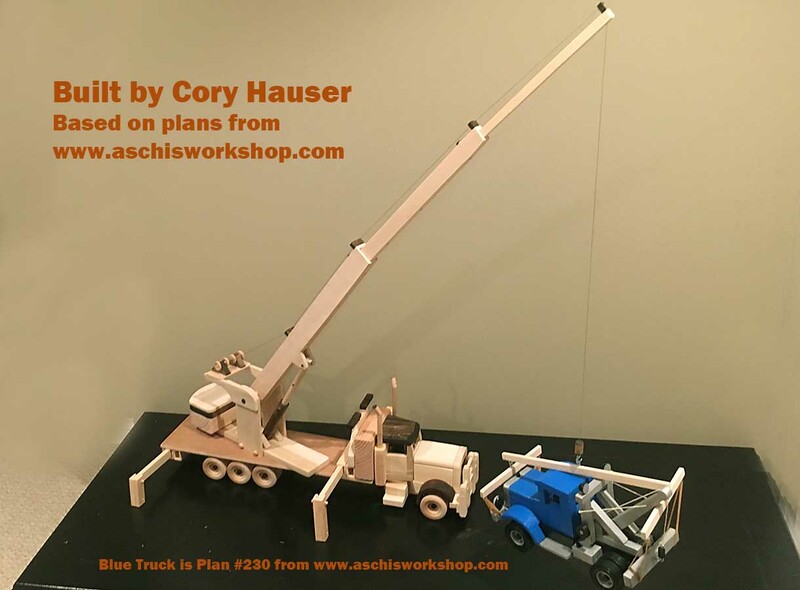 Cory Hauser has built this crane on the base of Aschi's Workshop plan #209. Cory has done an excelet job making the working crane. The Bull-Bar looks good on the truck and makes it a real Australian Model. 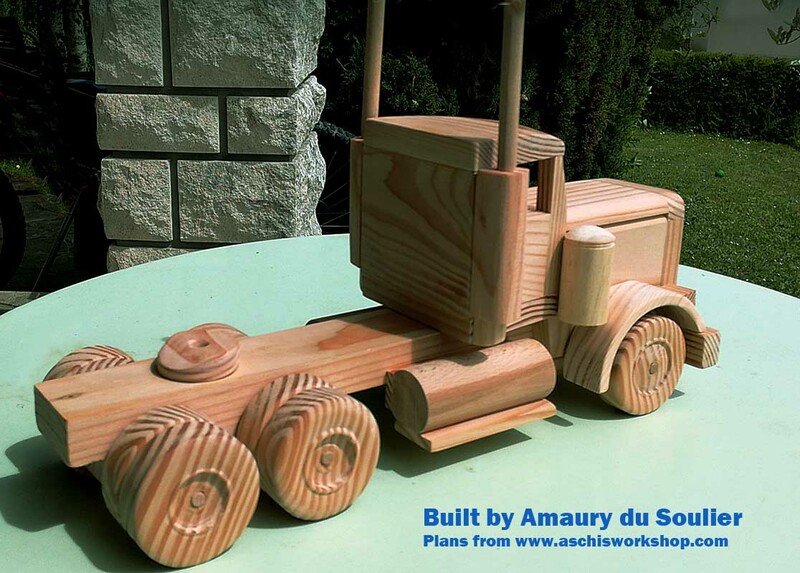 Bull-Bar is a FREE PLAN from Aschi's Workshop. 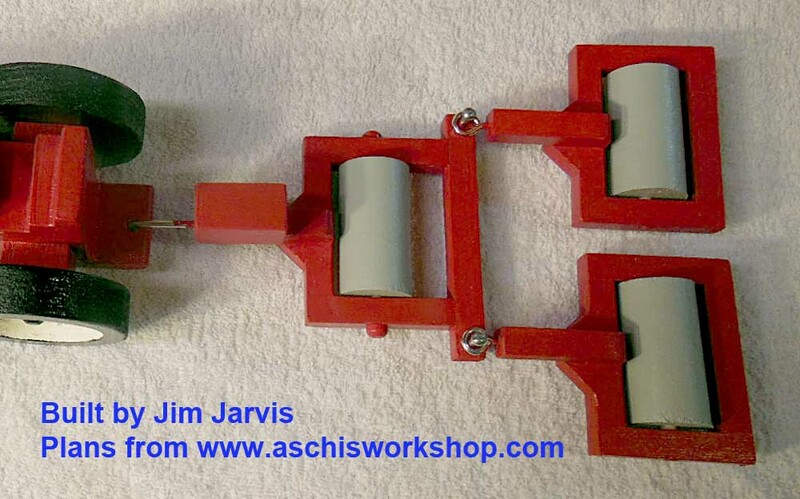 John Rhodes from New Zealand has built this model from Aschi's Workshop Plans. 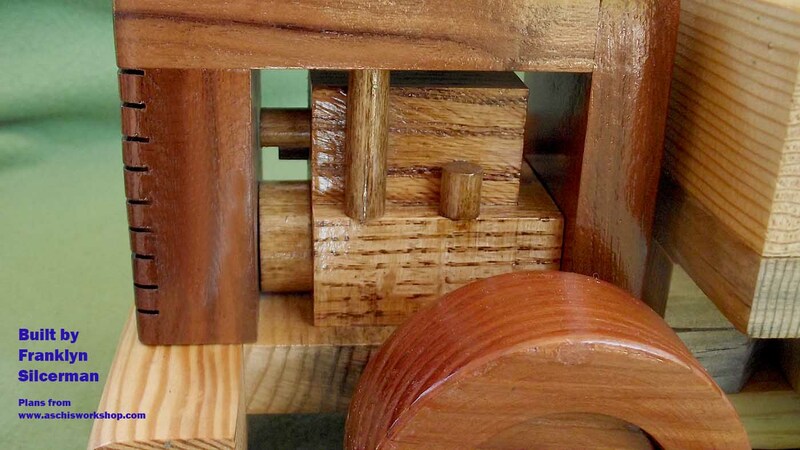 Excelent woodwork John! 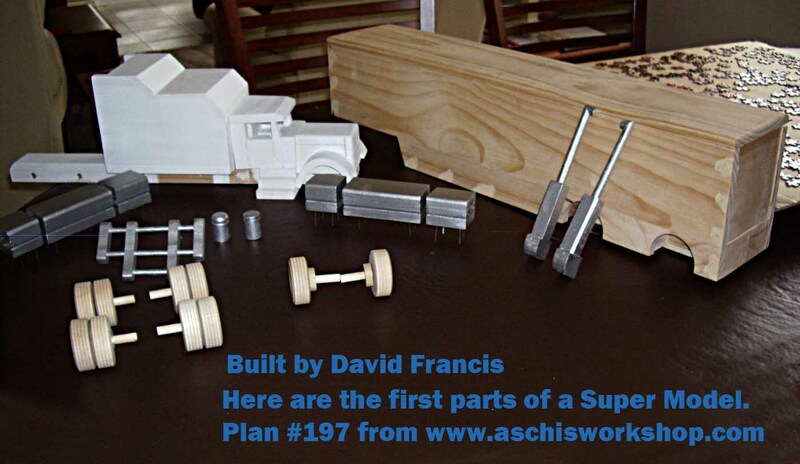 Check out the Toy and Model Plans from Aschi's Workshop. Baqsed on the real thing, to scale and easy to build. Get your FREE PLANS today. 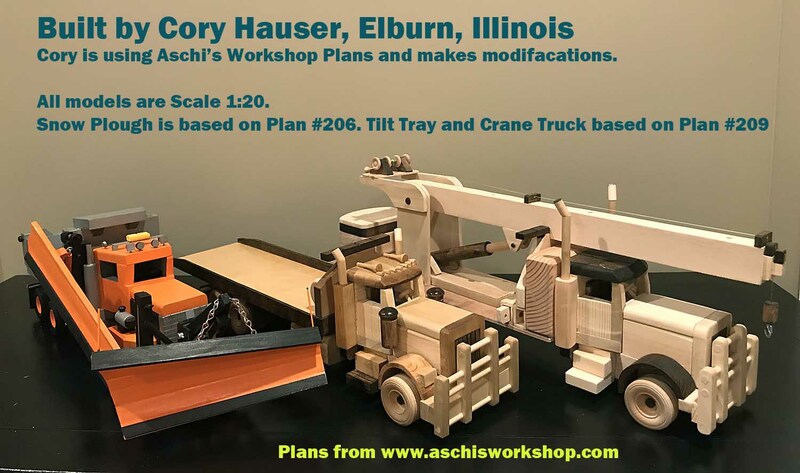 Chris Alles from Ontario is buiding models from Aschi's Workshop Plans. 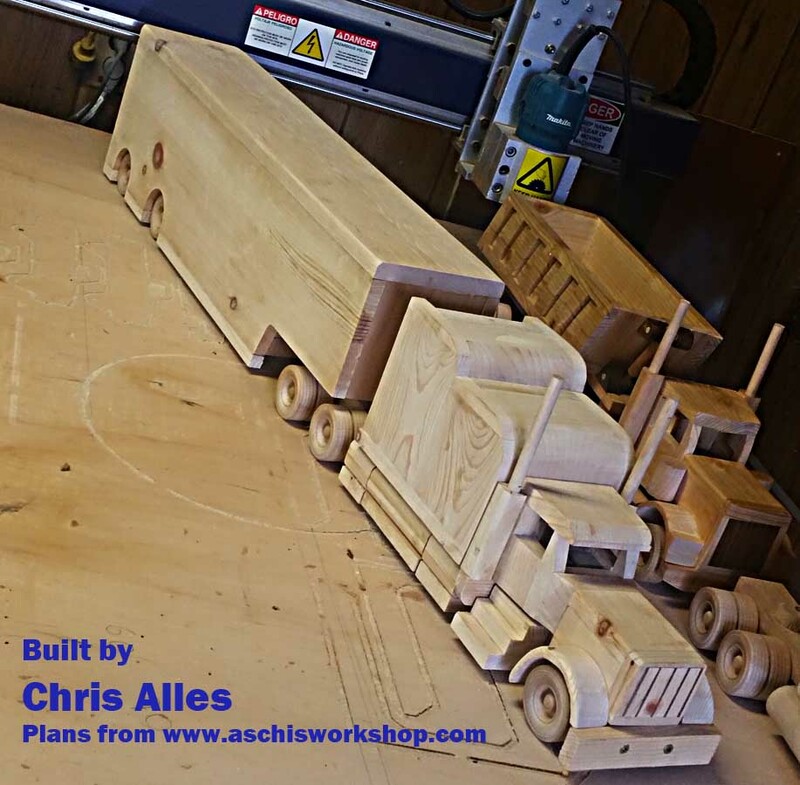 Request your FREE PLANS today from Aschi's Workshop. 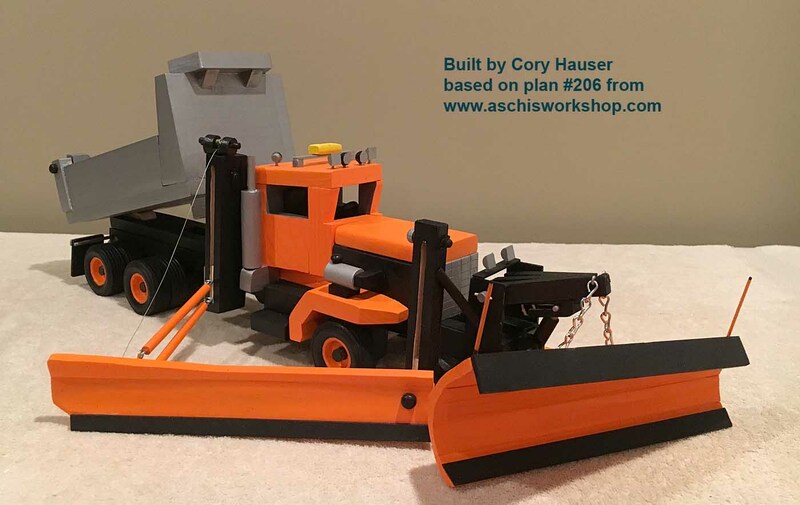 Chris Alles from Ontario is building models from Aschi's Workshop Plans. The AMERICAN Custom Rig is the favourite. 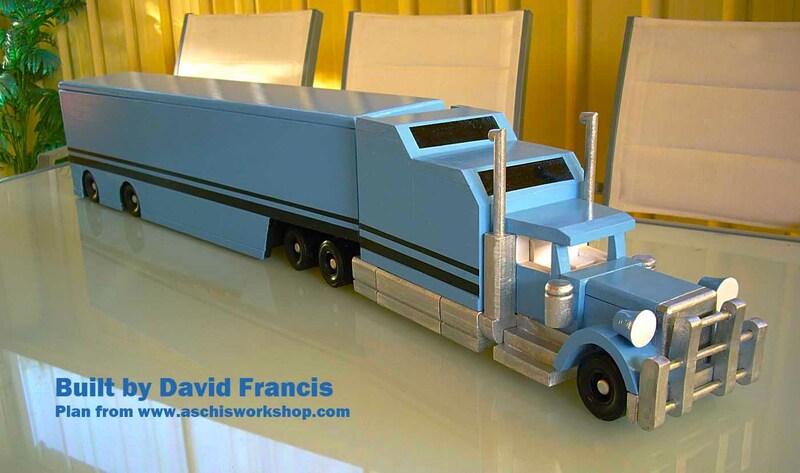 David Francis from Falcon, Western Australia has built model trucks of his own designe for a long time. 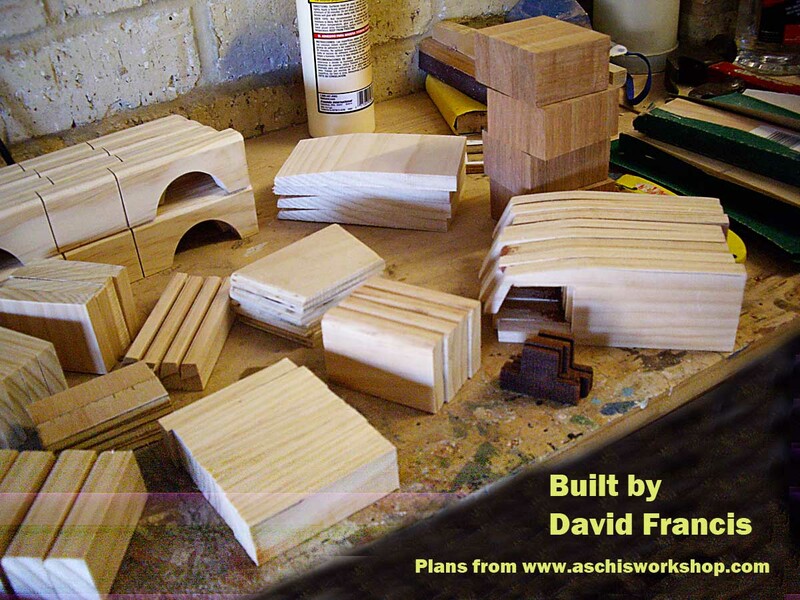 David is now buiding from Aschi's Workshop Plans. 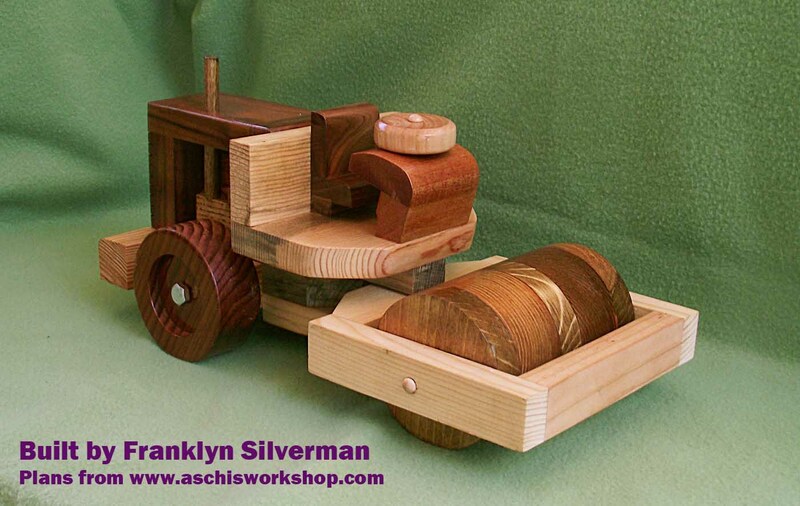 Franklyn Silverman is building from Aschi's Workshop Plans. 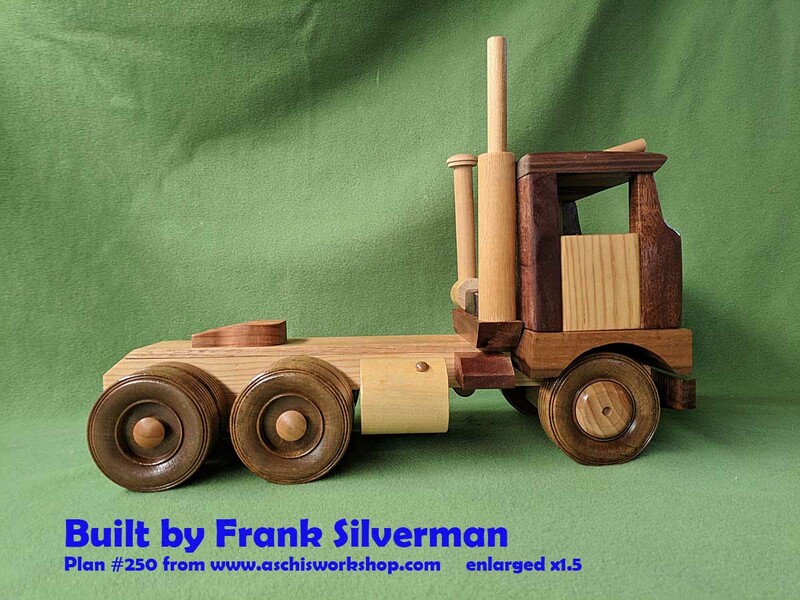 See more from Frank's work: Click here. 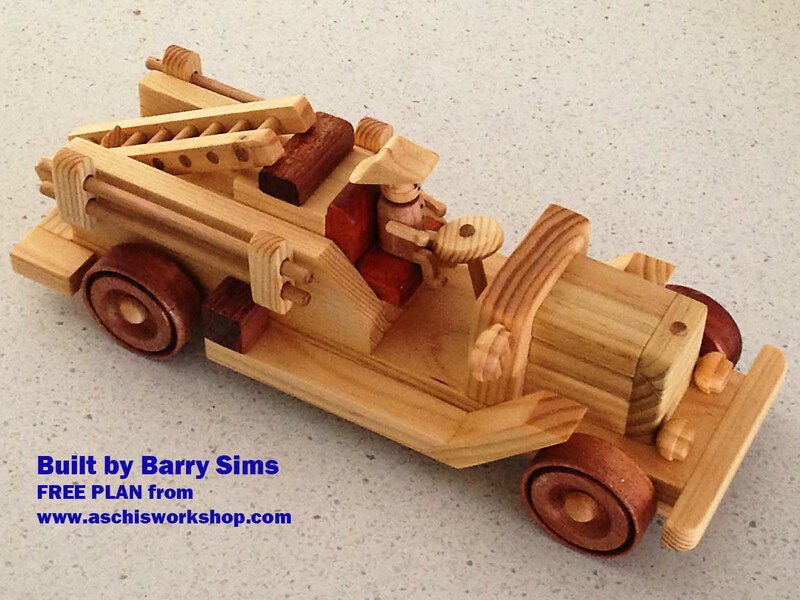 Steve Pinder, Queensland / Australia "I have not been making wooden toys for so long, about 2 years I guess. I was involved in making Fibreglass, Resin and Styrene scale warships many years ago mainly Royal Navy ships for Remote Control. Ships generally about 2M long. 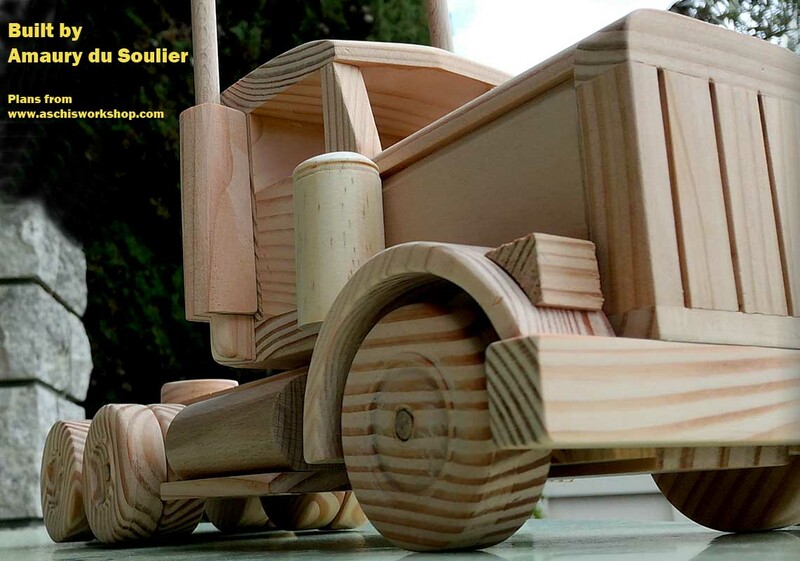 Since I have retired I have taken up making sawdust which I enjoy immensely and in particular, the making of toys for the pleasure of myself and for the underprivileged children on Mount Tamborine and country kids. 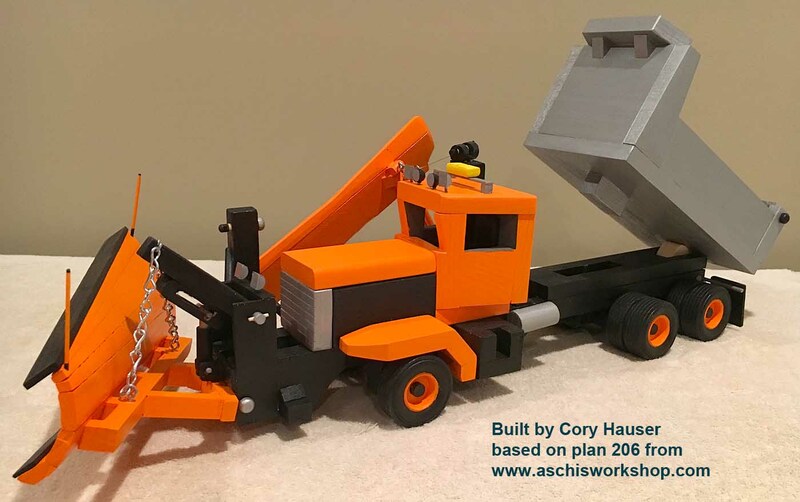 Aschi's Workshop Plans are ideal for this as the finished products are realistic yet robust enough to be played with vigorously! I look forward to getting many more plans from your growing web-page. 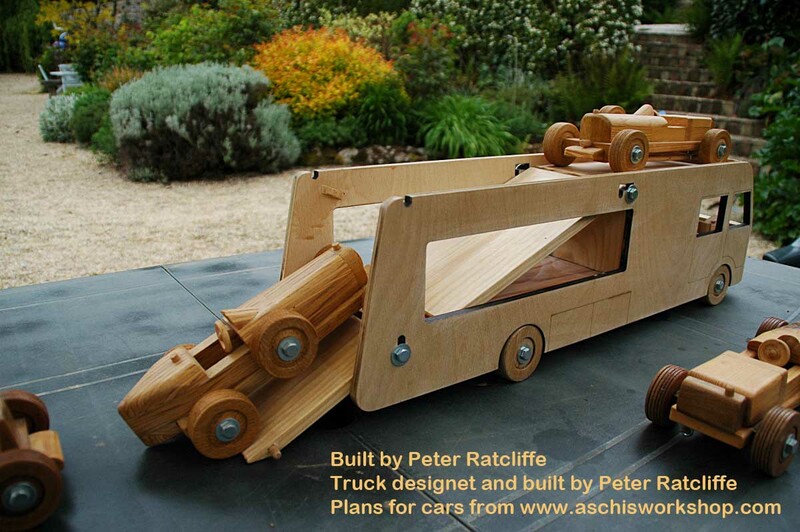 Gerry Hannigan from Calgary / Canada has built the Oshkosh Truck in different versions from Aschi's Workshop Plans. Gerry has his own page on petersportal. 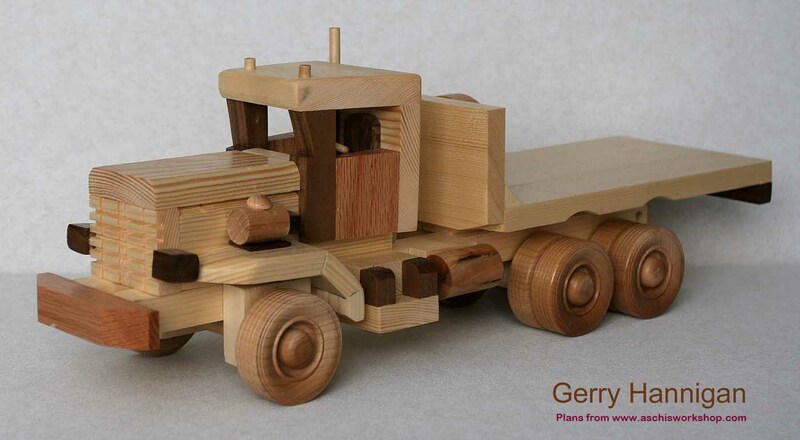 See the many models built by Gerry and photograped by his wife Deyna. 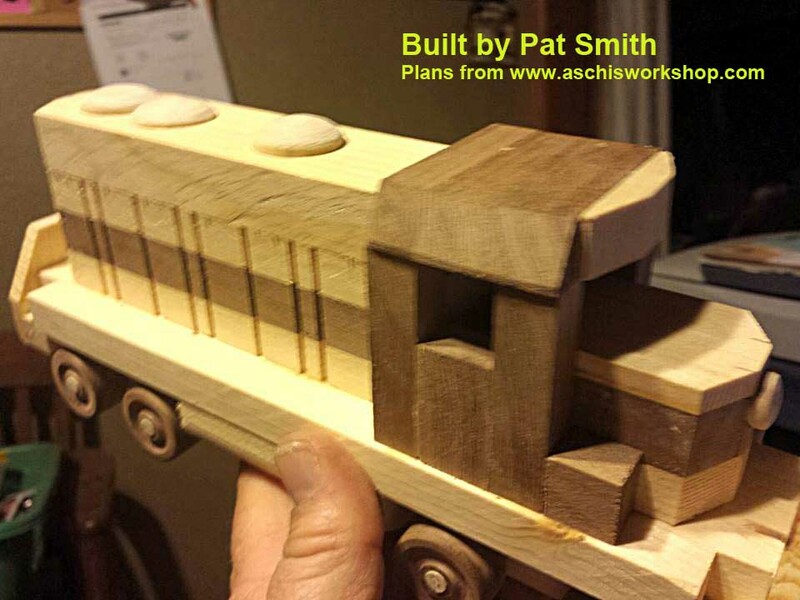 Pat Smith from California is building traind from Aschi's Workshop Plans. Pats favorite is the Christmas Train #199. 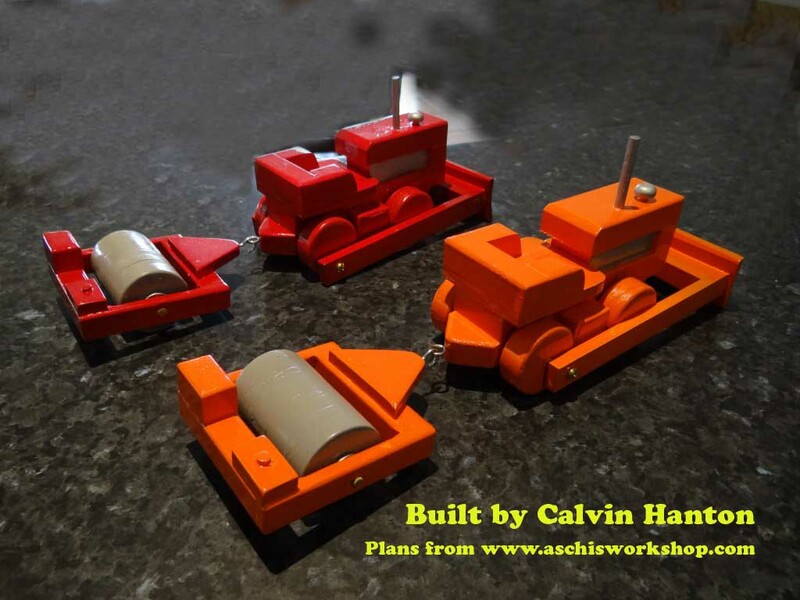 Cal Hanton from Queensland / Australia has built 3 Fire Trucks from Aschi's Workshop FREE PLAN. Cal has done an excellent job. Peter Ratcliffe: I still make a lot of the A,B and M type cars and have added a WO type (Bentley) to the range. I have just completed my first Transporter very much designed on the principles of your designs. I did however have the sides laser cut. 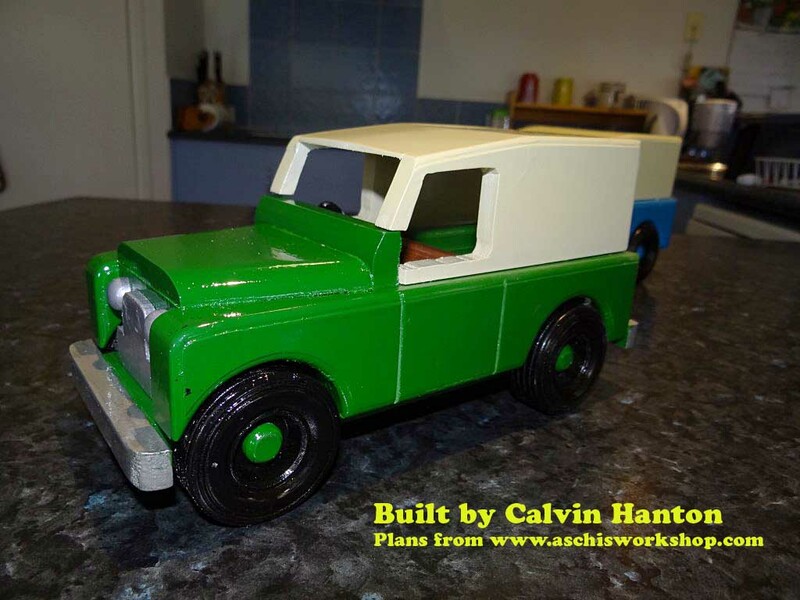 Calvin Hanton from Queensland / Australia has built the LandRover (Plan #188) and the Dozer (free plan) with the Vibro Roller (Plan #116) from Aschi's Workshop Plans. Calvin has mounted a small chain to the shield from preventing it from falling down. 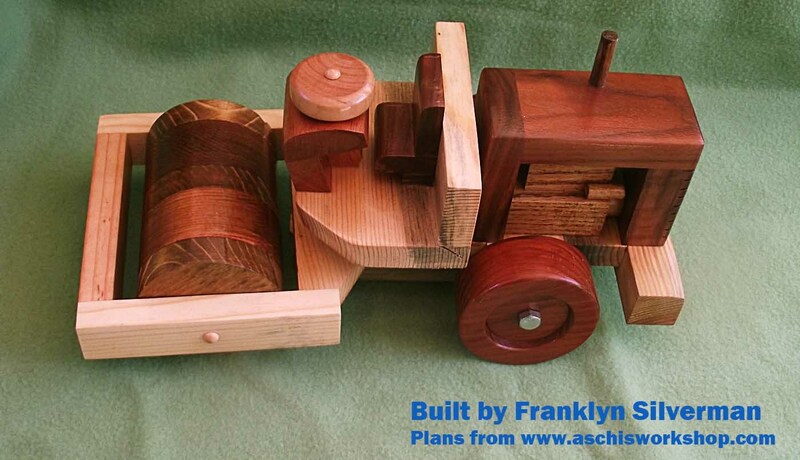 Aschi's Workshop has the plans. 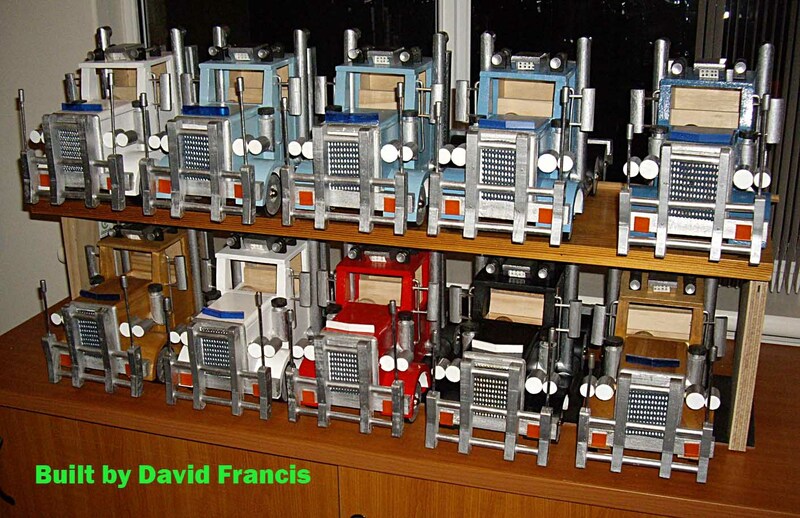 This row of pictures shows the big selection of models from Master Buider Xavier Pousset. 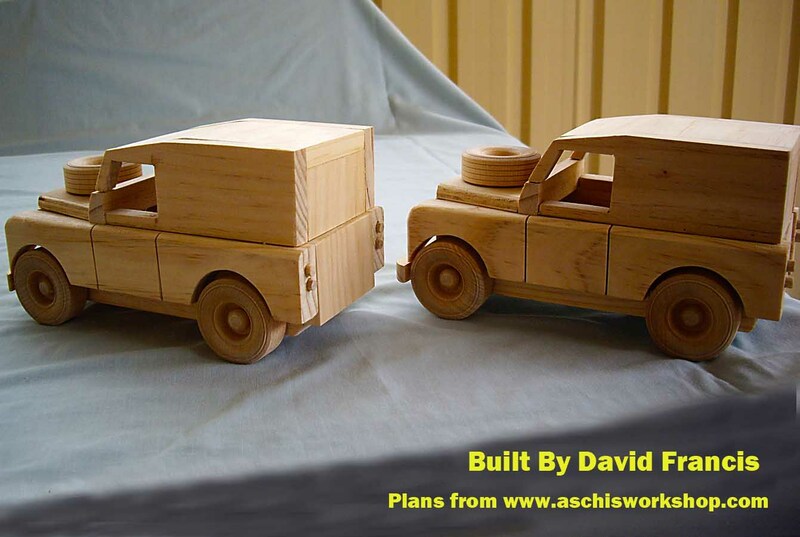 The old Scammell 1932 is plan #125, the Island Cabin Truck is plan #161 and the Ftre Truck is a FREE PLAN from Aschi's Workshop for you to test Aschi's Workshop Plans. 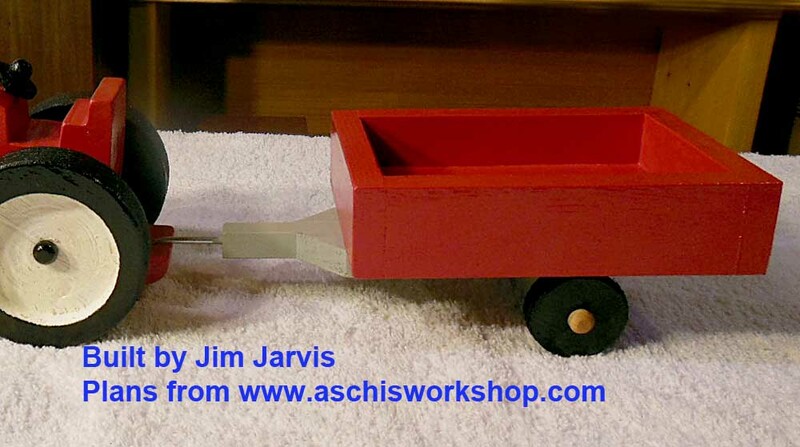 Jim Jarvis from New York is building toys and models from Aschi's Workshop Plans. 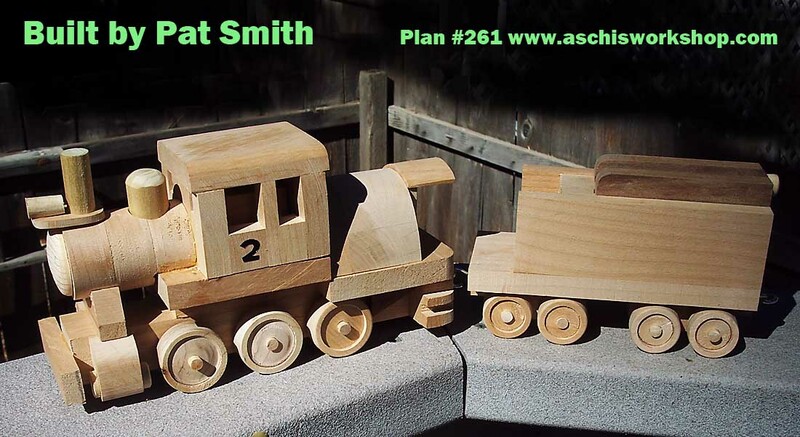 Aschi's Workshop has a big selection on easy to make Wooden Toy and model plans. CLICK HERE and check it out. 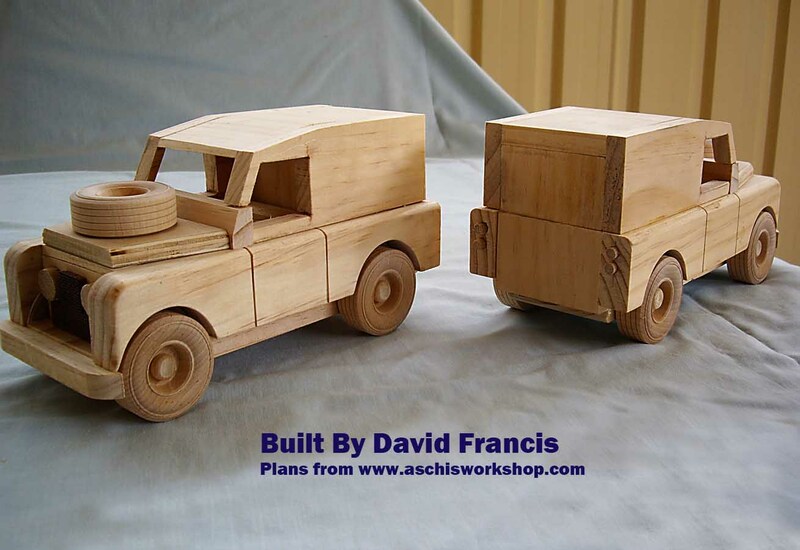 Kevin Tudor , UK, has built the Fire Truck – Free Plan from Aschi’s Workshop. 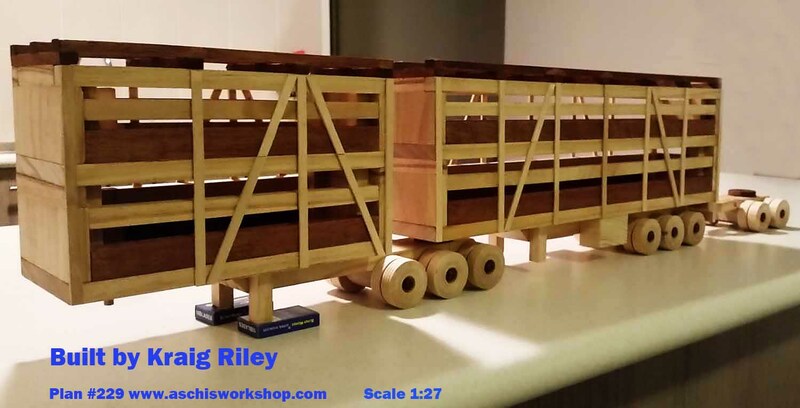 Kevin has used selected lumber/ wood to build this stunning model. 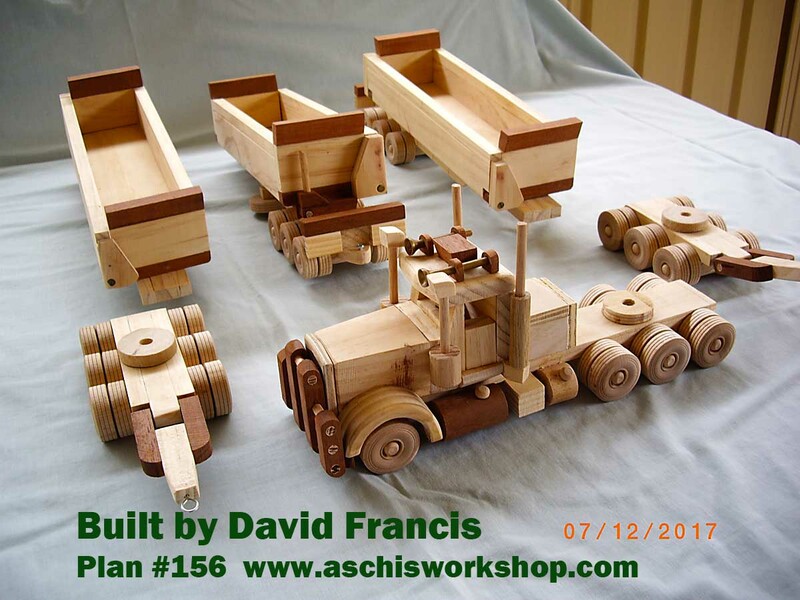 Check out all FREE PLANS from Aschi's Workshop. 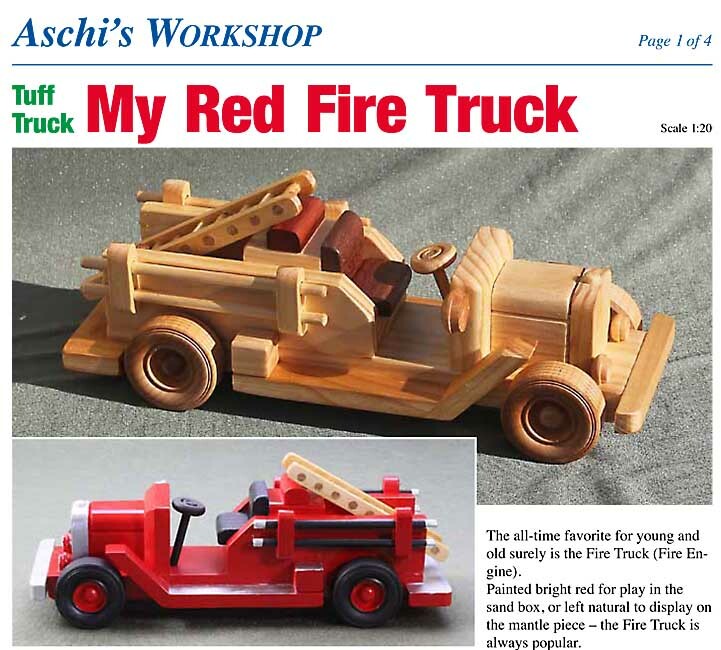 The Plan for the Fire Truck is a FREE PLAN from Aschi's Workshop. Request today... you get the plan as PDF in your e-mail. 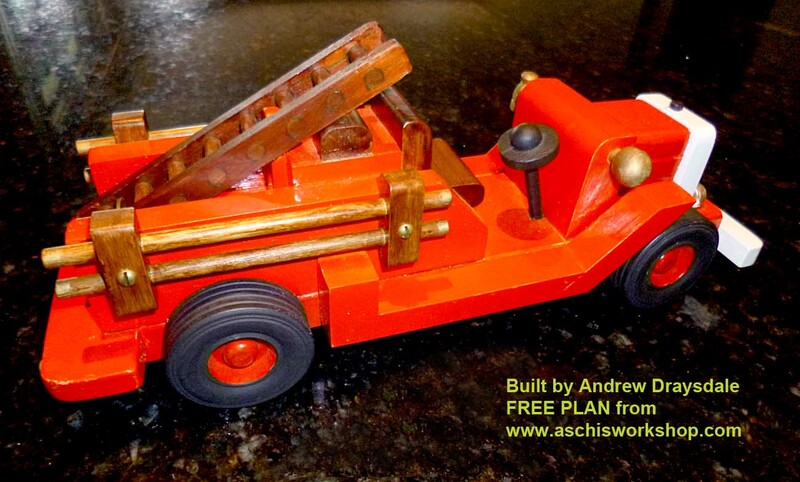 Andrew Draysdale from NSW / Australia Has built this Fire Truck from the FREE PLAN from Aschi's Workshop. 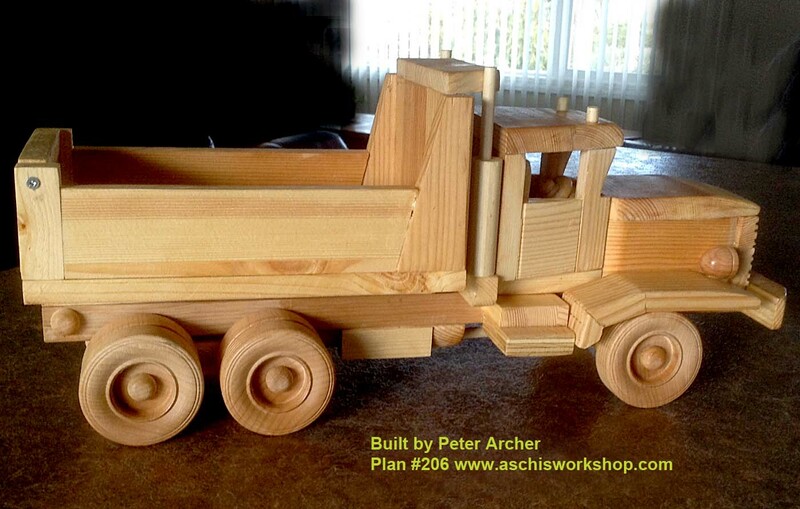 Peter Archer from British Columbia / Canada has built this impressive model from Aschi's Workshop Plan #206. 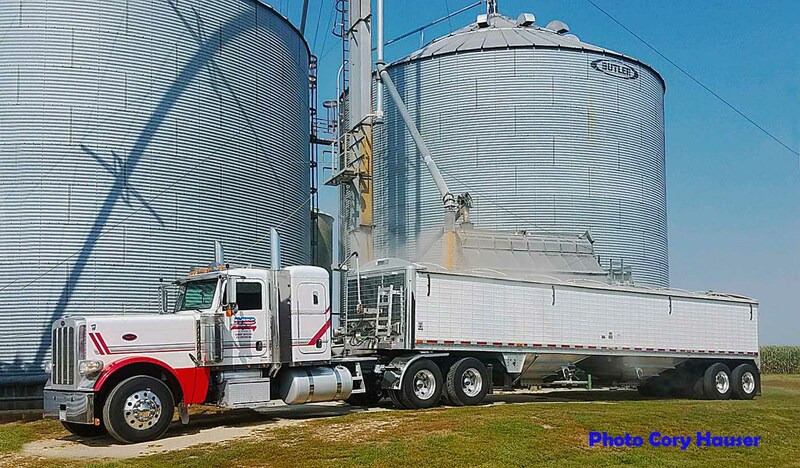 Keith Matthews from Mooresville, North Carolina. USA . 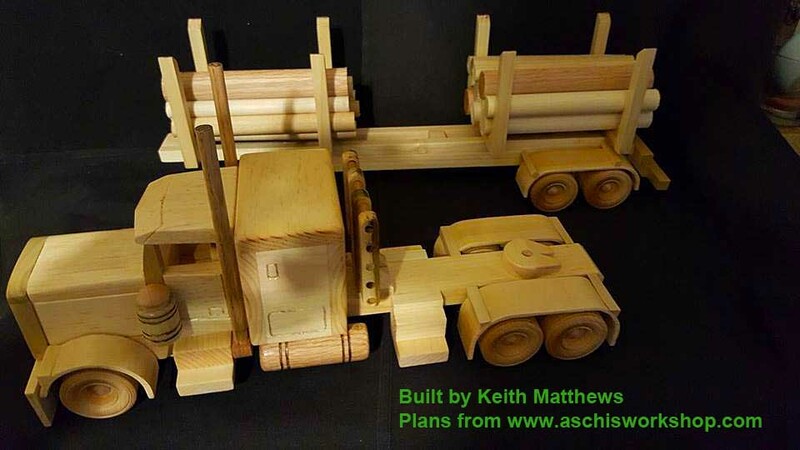 Keith is building models from Aschi's Workshop plans with modifications. 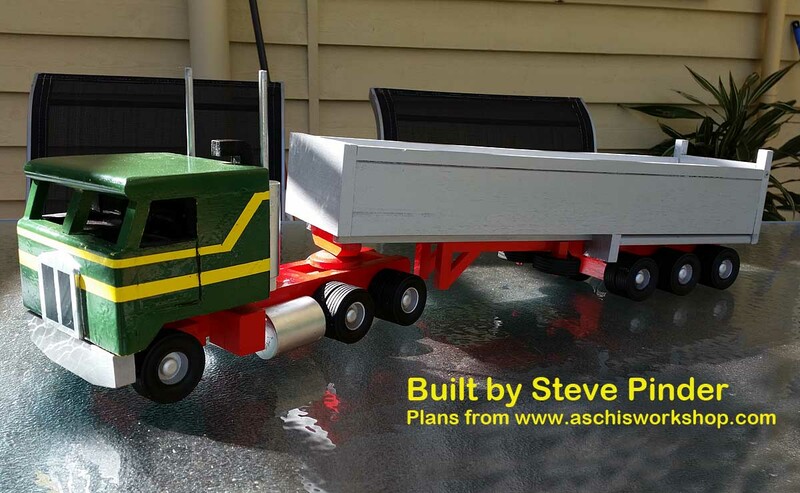 Aschi's Workshop plans #209 with BONUS PPLAN for Bullbar and plan #214 made this this model possible to build. 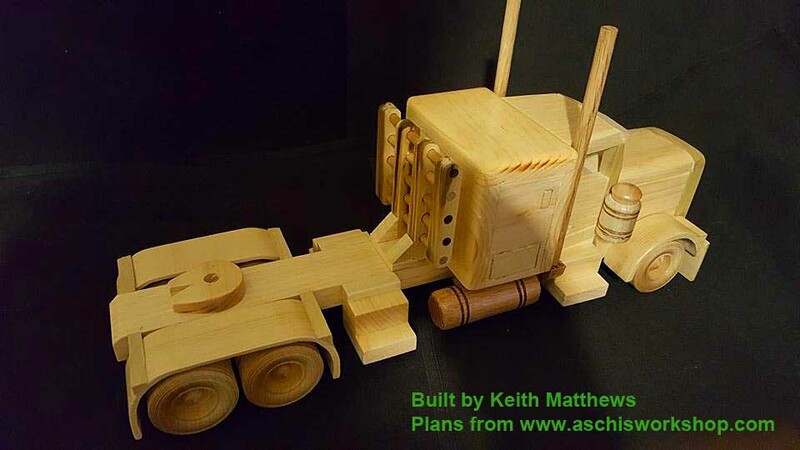 Keith used Aschi's plan #209 as base and made this SUPER TRUCK. 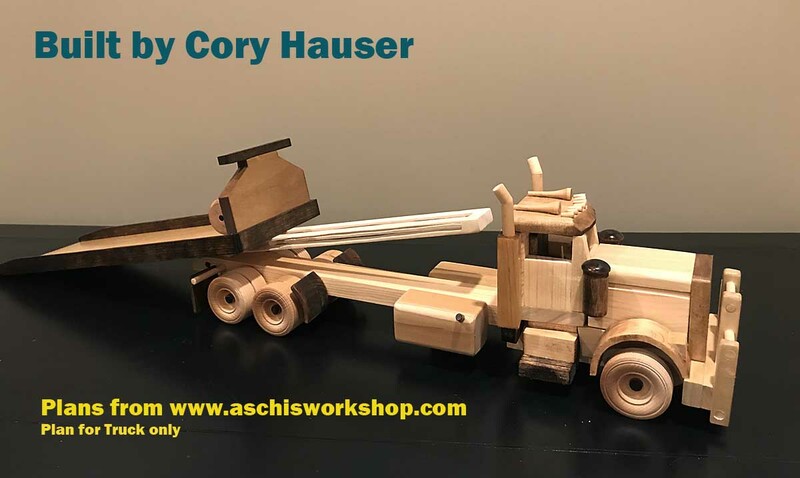 Cory Hauser is building toys and models like the DOZER and the FIRE TRUCK from Aschi's Workshop FREE PLANS. 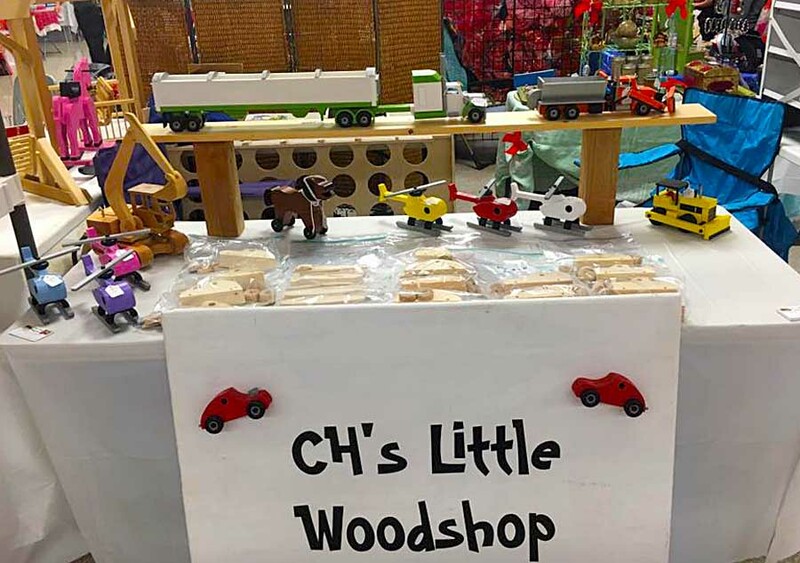 He sales toys at his CH's Little Woodshop store.